Well you can sort of feel the March sun helping things out theses days…as the sun’s angle get’s higher in the sky…the sun’s intensity increases from the winter minimum in the KC area…so it’s “feeling” a little better and many don’t realize that our average high for this time of the year is around 50°…so it’s supposed to be better swinging into March. As I mentioned yesterday, March though can be fickle and one can’t help but feel that we’re not done with winter yet. The colder shots of air may not be as brutal but compared to average at least may still be something to be reckoned with. For now though, aside from a bit of a brief setback on Saturday…we’re looking more comfortable through Monday, which looks to be the warmest day of the year thus far…and the warmest since this past mid-November when it hit 70° on the 16th. So there is some good news as we start the blog today. Here is something that I’ll be watching though…and it’s a storm that s off the Alaska Aleutians and while it’s “messy” looking with various swirls and circulations it is something that needs to be watched…because at least our EURO model is taking one of these pieces, and is consistently trying to create at least some snow…or rain>snow here later Tuesday into Wednesday AM. In reality as I try and trace the origins of the storm that MAY give us our next decent shot of precip…it is actually to the west of this storm complex. As a matter of fact it’s a combination of a piece of wind energy near Japan that will interact with the storm complex off AK. The modeling is all over the place with those that dislike the snow hoping for the EURO model to be wrong…there is some ensemble model support for the EURO to be closer to reality…but it’s really FAR too early to worry about this potential…whenever you’re dealing with storms interacting with each other in the middle of the Pacific Ocean…confidence doesn’t exactly soar with the model data…one way or the other. There will be a fast moving system this Saturday that can create some snow or rain>snow in the region…so let’s not forget about that. Amounts don’t look overly impressive at this point. The cold weather will ease somewhat over the next 5 days (on average). Not only here but elsewhere through the upper Midwest. 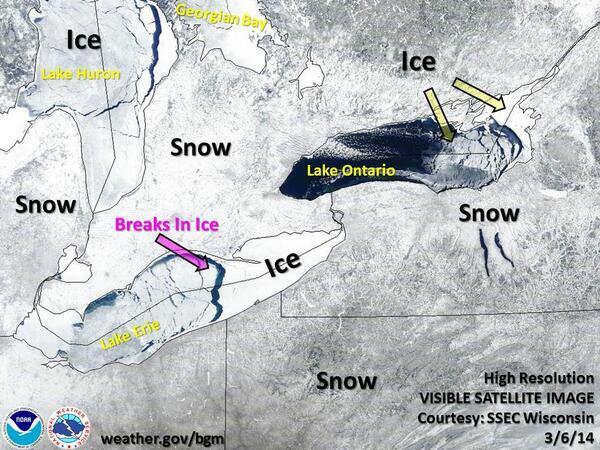 I wanted to take a minute to show you a cool animated gif that I made yesterday that illustrates the big difference in the Great Lakes region between last March and this March with regards to ice cover through the Great Lakes. It’s pretty cool! There has been a tremendous increase in the ice coverage…and for this time of the year…it’s near record levels. This ice is helping to create some brutally colder days/nights across parts of MI. Temperatures this AM in Gaylord, Pellston, and Alpena where in the 15-25° below 0 range! It’s been a brutal winter up there and with all the ice/snow still on the ground and in the water…you really get the sense that a chilly spring (at least early on) is on tap for them. Statewide tornado siren test that was postponed from Tuesday. Nothing to fear. It is usually the first Wednesday of every month….not sure why they did not do it yesterday. Oooh, okay, Thank you all so much!